Preface. Down North on the Labrador Circuit: The Court of Civil Jurisdiction 1826 to 1833. The French Revolution and Napoleonic and American wars of the early nineteenth century disrupted the migratory fishery between England and Newfoundland and stimulated economic growth in Newfoundland. Growth included extension of Newfoundland's northeastern fishery to Labrador in pusuit of Labrador's rich resources of fish, seal, salmon and fur. Settlement grew and in time disputes came to the attention of authorities on the Island. In 1824 an Act “...for the Better Administration of Justice in Newfoundland” was passed introducing a new system of itinerant courts in Newfoundland and instituting a Court of Civil Jurisdiction on the Coast of Labrador. From 1826 to 1833 Judge William Paterson, former Captain in the Royal Navy, made annual visits to communities in Labrador. Cases primarily concerned relationships between merchants and planters and planters and fishermen. The court records demonstrate that litigants often compromised rather than have their dispute brought to trial and, in the interests of a speedy resolution Judge Paterson promoted the use of informal local artitrators. The numbers of cases were modest and seemed to reflect the small population that lived in Labrador. However, when evaluated on a per capita basis, the records revealed that disputes may have been more frequent there than in the Northern District of Newfoundland, home to half of the island's population. Representing government brought fiscal matters of Newfoundland and Labrador under close local scrutiny. It was found that eighty percent of annual expenditures were used to administer the justice system. British authorities had questioned the effectiveness of the Labrador Court as early as 1828. Despite pleas from the Governor, Chief Justice and Attorney General, the government decided that the number of cases in Labrador did not justify the cost. In 1834 Labrador's Court of Civil Jurisdiction was formally discontinued through an Act passed by the newly formed House of Assembly. Complaints abounded but to no avail. It would take almost thirty years before a justice system would return to the coast of Labrador. Labrador's history is inextricably linked with Newfoundland and its legal history is no different. Through this essay, Labrador can take its place alongside the early legal history of the island and the province's evolving administrative structures in the early nineteenth century. There is much research yet to be done. 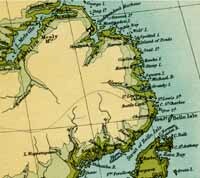 Detail from a map of Labrador by J.G. Bartholomew, ca. 1895, showing Seal Island. From W.G. Gosling, Labrador - Its Discovery, Exploration and Development, (London: Alston Rivers Limited, 1910) 480.